U.S. Rep. Blake Farenthold, R-Corpus Christi, announced Thursday he would retire from Congress after finishing his current term following new allegations that included former employees describing him as verbally abusive and sexually demeaning. 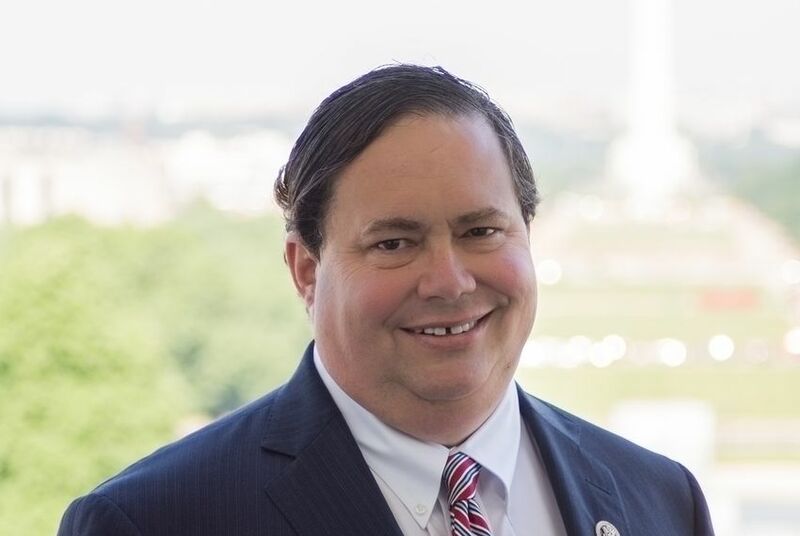 WASHINGTON — U.S. Rep. Blake Farenthold, R-Corpus Christi, will retire from Congress after finishing his current term, a source close to the congressman told The Texas Tribune on Thursday morning. Farenthold soon confirmed the decision in an emotional video posted on Facebook. The decision came after a difficult December for the four-term congressman. Farenthold, one of the quieter members of the Texas delegation, found himself embroiled in a charged atmosphere of sexual harassment allegations in Washington, D.C. The final blow came in the form of a CNN report on Wednesday night highlighting new sexual harassment allegations that included former employees describing the congressman as verbally abusive and sexually demeaning. "I'd never served in public office before," Farenthold said of the allegations in his video Thursday. "I had no idea how to run a congressional office and, as a result, I allowed a workplace culture to take root in my office that was too permissive and decidedly unprofessional. It accommodated destructive gossip, off-hand comments, off-color jokes and behavior that in general was less than professional. "And I allowed the personal stress of the job to manifest itself in angry outbursts and too often a failure to treat people with the respect that they deserved," he added. "That was wrong. Clearly, it's not how I was raised, it's not who I am and for that situation, I am profoundly sorry." While he "expected a tough primary campaign" and "was looking forward to it," Farenthold said he would retire instead. "I would be forced to engage in a month-long campaign for personal vindication," he said. "That's not why I came to Congress. Quite simply, my constituents deserve better." Farenthold was under enormous pressure from House GOP leadership to step down. House GOP sources familiar with the events of the past 24 hours tell the Tribune that he met with the National Republican Congressional Committee Chairman Steve Stivers on Wednesday evening and spoke with U.S. House Speaker Paul Ryan twice that night. The sources did not tell the Tribune what was discussed at these meetings. Farenthold's decision to retire comes just days after the Monday statewide candidate filing deadline. Though he is no longer running for re-election, Farenthold's name will remain on the 2018 Republican primary ballot along with at least six other challengers, according to the Texas Secretary of State's office. On Dec. 1, a Politico report brought attention to a three-year-old dispute involving accusations that Farenthold's allegedly inappropriate behavior led to the termination of a former staffer, Lauren Greene. The two parties settled the matter out of court two years ago, and the controversy was all but dormant. But Politico revealed that the money used to settle the case — $84,000 — came from taxpayer funds. Greene's charges also were simply no longer palatable to a Capitol Hill community that is in flames over sexual harassment accusations. In the first full week of December, no fewer than three members of Congress — two from the House and one from the Senate — resigned from Congress over their own controversies. Behind the scenes and in public, Farenthold firmly maintained his innocence. In his video Thursday, Farenthold reiterated his defense against Greene's 2014 complaint – pointing to the Office of Congressional Ethics' previous recommendation to dismiss the investigation. "An unprofessional work environment is not a crime, but it is embarrassing to me and to my family," Farenthold said in his video. He added later: "I want to be perfectly clear: the charges that were made were false." But last week, the House Ethics Committee established a subcommittee to further examine Greene's charges. Furthermore, the Houston Chronicle recently reported that Farenthold's office sensitivity and sexual harassment training in 2016. Farenthold spent the last week under incredible pressure from his colleagues in Congress and Republicans in Texas. At a news conference Thursday morning, Ryan expressed support for Farenthold's decision to retire. "There are new stories that are very disconcerting, unacceptable behavior have been alleged in those stories and I think he's made the right decision that he's going to be leaving Congress and that reflects on the conversations we've had," Ryan said. First elected to Congress in 2010, Farenthold was part of the massive wave that landed the GOP in control of the U.S. House. His race was a late-developing upset in what most political operatives believed was a safely Democratic seat. But by October 2010, Farenthold gained ground as the campaign of longtime Democratic incumbent U.S. Rep. Solomon Ortiz collapsed. In the next round of redistricting, Republican mapmakers dramatically redrew his district to protect the seat from a substantive Democratic challenge in the future. Even after Greene's accusations came to light in 2014, no serious candidate in either party mounted a serious challenge to Farenthold — although Democrats did attempt to recruit candidates in the Corpus Christi-based district in early 2015. But re-election looked much tougher this time around. The candidate field against him was shaping up to be strong. Bech Bruun, the now-former chairman of the Texas Water Development Board, resigned from that position last week in order to challenge Farenthold for the nomination. Other Republicans were already running, including Michael Cloud, a member of the State Republican Executive Committee and former chairman of the Victoria County GOP, Christopher Mapp, Jerry Hall and Eddie Gassman, have also lined up for potential campaigns. At least two Democrats are running for the seat as well. Farenthold spent much of his time in Congress working on transportation and judicial policy. A former local radio host and computer consultant, Farenthold is an effective communicator on technology issues. But he stumbled on other fronts. Most recently, he suggested — in jest — that he would like to duel several female senators who were opposed to the GOP health care overhaul. Farenthold is a sixth-generation Texan with a prominent political last name. His step-grandmother is Frances "Sissy" Farenthold, a Democratic former member of the state House and a 1972 candidate for governor. Farenthold is the eighth member of the Texas delegation to announce he is leaving Congress after their current term. U.S. Reps. Sam Johnson, R-Richardson; Lamar Smith, R-San Antonio; Jeb Hensarling, R-Dallas; and Ted Poe, R-Humble, Gene Green, D-Houston and Joe Barton, R-Ennis announced their retirements this year. U.S. Rep. Beto O'Rourke , D-El Paso, is leaving his seat to run for U.S. Senate.